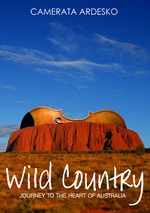 Discover Australia with Wild Country, the latest production from Camerata Ardesko. Centered around the ever-changing natural landscape of this vast continent, Wild Country will take you on an unforgettable journey of discovery created by the merging of music and photography. The live concert performed by chamber orchestra Camerata Ardesko under the leadership of Melanie Waite (violin), will transport you into the captivating sound world of five of Australia's leading composers. During the concert you will be simultaneously treated to a video projection of breathtaking images from around Australia which has been specially produced around the music. In this programme which features a variety of styles, the influence of Australian indigenous culture will be heard in two pieces when the orchestra is joined by guest didjeridu player, Catalin Milea. There is also the opportunity to enjoy a separate photographic exhibition by Australian nature photographer Helen Daintree featuring some of Australia's wildest places.